"Indus Valley" redirects here. For the Bronze Age civilisation, see Indus Valley Civilisation. For the constellation, see Indus (constellation). Indus River in Kharmang District, Pakistan. The Indus River (locally called Sindhu) is one of the longest rivers in Asia. Originating in the Tibetan Plateau in the vicinity of Lake Manasarovar, the river runs a course through the Ladakh region of Jammu and Kashmir, India towards the Gilgit-Baltistan region of Pakistan and the Hindukush ranges, and then flows in a southerly direction along the entire length of Pakistan to merge into the Arabian Sea near the port city of Karachi in Sindh. It is the longest river and national river of Pakistan. The river has a total drainage area exceeding 1,165,000 km2 (450,000 sq mi). Its estimated annual flow stands at around 243 km3 (58 cu mi), twice that of the Nile River and three times that of the Tigris and Euphrates rivers combined, making it one of the largest rivers in the world in terms of annual flow. The Zanskar is its left bank tributary in Ladakh. In the plains, its left bank tributary is the Panjnad which itself has five major tributaries, namely, the Chenab, Jhelum, the Ravi, the Beas, and the Sutlej. Its principal right bank tributaries are the Shyok, the Gilgit, the Kabul, the Gomal, and the Kurram. Beginning in a mountain spring and fed with glaciers and rivers in the Himalayas, the river supports ecosystems of temperate forests, plains and arid countryside. The northern part of the Indus Valley, with its tributaries, forms the Punjab region, while the lower course of the Indus is known as Sindh and ends in a large delta. The river has historically been important to many cultures of the region. The 3rd millennium BC saw the rise of a major urban civilization of the Bronze Age. During the 2nd millennium BC, the Punjab region was mentioned in the hymns of the Hindu Rigveda as Sapta Sindhu and the Zoroastrian Avesta as Hapta Hindu (both terms meaning "seven rivers"). Early historical kingdoms that arose in the Indus Valley include Gandhāra, and the Ror dynasty of Sauvīra. The Indus River came into the knowledge of the West early in the Classical Period, when King Darius of Persia sent his Greek subject Scylax of Caryanda to explore the river, ca. 515 BC. This river was known to the ancient Indians in Sanskrit as Sindhu and the Persians as Hindu which was regarded by both of them as "the border river". The variation between the two names is explained by the Old Iranian sound change *s > h, which occurred between 850–600 BCE according to Asko Parpola. From the Persian Achaemenid Empire, the name passed to the Greeks as Indós (Ἰνδός). It was adopted by the Romans as Indus. The meaning of Sindhu as a "large body of water, sea, or ocean" is a later meaning in Classical Sanskrit. A later Persian name for the river was Darya, which similarly has the connotations of large body of water and sea. Other variants of the name Sindhu include Assyrian Sinda (as early as the 7th century BC), Persian Ab-e-sind, Pashto Abasind, Arab Al-Sind, Chinese Sintow, and Javanese Santri. India is a Greek and Latin term for "the country of the River Indus". The region through which the river drains into sea is called Sindh and owes its name to the river (Sanskrit: Sindhu). Megasthenes' book Indica derives its name from the river's Greek name, "Indós" (Ἰνδός), and describes Nearchus's contemporaneous account of how Alexander the Great crossed the river. The ancient Greeks referred to the Indians (people of present-day northwest India and Pakistan) as "Indói" (Ἰνδοί), literally meaning "the people of the Indus". The Rigveda describes several rivers, including one named "Sindhu". The Rigvedic "Sindhu" is thought to be the present-day Indus river. It is attested 176 times in its text, 94 times in the plural, and most often used in the generic sense of "river". In the Rigveda, notably in the later hymns, the meaning of the word is narrowed to refer to the Indus river in particular, e.g. in the list of rivers mentioned in the hymn of Nadistuti sukta. The Rigvedic hymns apply a feminine gender to all the rivers mentioned therein, except the Bramhaputra and the "Sindhu" which carry the masculine gender. This gender usage could mean that the Sindhu river was believed to be a warrior, and thus one of the greatest among all the rivers in the whole world. In other languages of the region, the river is known as सिन्धु (Sindhu) in Hindi and Nepali, سنڌو (Sindhu) in Sindhi, سندھ (Sindh) in Shahmukhi Punjabi, ਸਿੰਧ ਨਦੀ (Sindh Nadī) in Gurmukhī Punjabi, اباسين (Abāsin lit. "Father of Rivers") in Pashto, نهر السند (Nahar al-Sind) in Arabic, སེང་གེ་གཙང་པོ། (singi khamban lit. "Lion River" or Lion Spring) in Tibetan, 印度 (Yìndù) in Chinese, and Nilab in Turki. Babur crossing the Indus River. The Indus River provides key water resources for Pakistan's economy – especially the breadbasket of Punjab province, which accounts for most of the nation's agricultural production, and Sindh. The word Punjab means "land of five rivers" and the five rivers are Jhelum, Chenab, Ravi, Beas and Sutlej, all of which finally flow into the Indus. The Indus also supports many heavy industries and provides the main supply of potable water in Pakistan. The Indus is one of the few rivers in the world to exhibit a tidal bore. The Indus system is largely fed by the snows and glaciers of the Himalayas, Karakoram and the Hindu Kush ranges of Tibet, the Indian states of Jammu and Kashmir and Himachal Pradesh and Gilgit-Baltistan region of Pakistan. The flow of the river is also determined by the seasons – it diminishes greatly in the winter, while flooding its banks in the monsoon months from July to September. There is also evidence of a steady shift in the course of the river since prehistoric times – it deviated westwards from flowing into the Rann of Kutch and adjoining Banni grasslands after the 1816 earthquake. Presently, Indus water flows in to the Rann of Kutch during its floods breaching flood banks. The traditional source of the river is the Senge Khabab or "Lion's Mouth", a perennial spring, not far from the sacred Mount Kailash marked by a long low line of Tibetan chortens. There are several other tributaries nearby, which may possibly form a longer stream than Senge Khabab, but unlike the Senge Khabab, are all dependent on snowmelt. 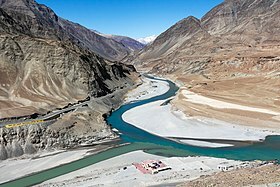 The Zanskar River, which flows into the Indus in Ladakh, has a greater volume of water than the Indus itself before that point. The major cities of the Indus Valley Civilisation, such as Harappa and Mohenjo-daro, date back to around 3300 BC, and represent some of the largest human habitations of the ancient world. The Indus Valley Civilisation extended from across northeast Afghanistan to Pakistan and northwest India, with an upward reach from east of Jhelum River to Ropar on the upper Sutlej. The coastal settlements extended from Sutkagan Dor at the Pakistan, Iran border to Kutch in modern Gujarat, India. There is an Indus site on the Amu Darya at Shortughai in northern Afghanistan, and the Indus site Alamgirpur at the Hindon River is located only 28 km (17 mi) from Delhi. To date, over 1,052 cities and settlements have been found, mainly in the general region of the Ghaggar-Hakra River and its tributaries. Among the settlements were the major urban centres of Harappa and Mohenjo-daro, as well as Lothal, Dholavira, Ganeriwala, and Rakhigarhi. Only 90–96 of more than 800 known Indus Valley sites have been discovered on the Indus and its tributaries. The Sutlej, now a tributary of the Indus, in Harappan times flowed into the Ghaggar-Hakra River, in the watershed of which were more Harappan sites than along the Indus. Most scholars believe that settlements of Gandhara grave culture of the early Indo-Aryans flourished in Gandhara from 1700 BC to 600 BC, when Mohenjo-daro and Harappa had already been abandoned. The word "India" is derived from the Indus River. In ancient times, "India" initially referred to those regions immediately along the east bank of the Indus, but by 300 BC, Greek writers including Herodotus and Megasthenes were applying the term to the entire subcontinent that extends much farther eastward. Indus River viewed from the Karakoram Highway. Confluence of Indus and Zanskar rivers. The Indus is at the left of the picture, flowing left-to-right; the Zanskar, carrying more water, comes in from the top of the picture. The Indus river feeds the Indus submarine fan, which is the second largest sediment body on the Earth. It consists of around 5 million cubic kilometres of material eroded from the mountains. Studies of the sediment in the modern river indicate that the Karakoram Mountains in northern Pakistan and India are the single most important source of material, with the Himalayas providing the next largest contribution, mostly via the large rivers of the Punjab (Jhelum, Ravi, Chenab, Beas and Sutlej). Analysis of sediments from the Arabian Sea has demonstrated that prior to five million years ago the Indus was not connected to these Punjab rivers which instead flowed east into the Ganga and were captured after that time. Earlier work showed that sand and silt from western Tibet was reaching the Arabian Sea by 45 million years ago, implying the existence of an ancient Indus River by that time. The delta of this proto-Indus river has subsequently been found in the Katawaz Basin, on the Afghan-Pakistan border. In the Nanga Parbat region, the massive amounts of erosion due to the Indus river following the capture and rerouting through that area is thought to bring middle and lower crustal rocks to the surface. In November 2011, satellite images showed that the Indus river had re-entered India, feeding Great Rann of Kutch, Little Rann of Kutch and a lake near Ahmedabad known as Nal Sarovar. Heavy rains had left the river basin along with the Lake Manchar, Lake Hemal and Kalri Lake (all in modern-day Pakistan) inundated. This happened two centuries after the Indus river shifted its course westwards following the 1819 Rann of Kutch earthquake. The Induan Age at start of the Triassic Period of geological time is named for the Indus region. 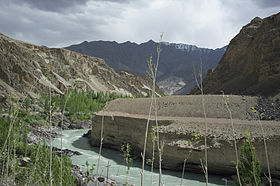 Accounts of the Indus valley from the times of Alexander's campaign indicate a healthy forest cover in the region, which has now considerably receded. The Mughal Emperor Babur writes of encountering rhinoceroses along its bank in his memoirs (the Baburnama). Extensive deforestation and human interference in the ecology of the Shivalik Hills has led to a marked deterioration in vegetation and growing conditions. The Indus valley regions are arid with poor vegetation. Agriculture is sustained largely due to irrigation works. The Indus river and its watershed has a rich biodiversity. It is home to around 25 amphibian species. The Indus river dolphin (Platanista indicus minor) is found only in the Indus River. It is subspecies of the South Asian river dolphin. The Indus river dolphin formerly also occurred in the tributaries of the Indus river. According to the World Wildlife Fund it is one of the most threatened cetaceans with only about 1,000 still existing. There are two otter species in the Indus River basin: the Eurasian otter in the northeastern highland sections and the smooth-coated otter elsewhere in the river basin. The smooth-coated otters in the Indus River represent a subspecies found nowhere else, the Sindh otter (Lutrogale perspicillata sindica). The Indus River basin has a high diversity, being the home of more than 180 freshwater fish species, including 22 which are found nowhere else. Despite declines of several major species, fishing remains an economically important activity in the Indus. Fish also played a major role in earlier cultures of the region, including the ancient Indus Valley Civilisation where depictions of fish were frequent. The Indus script has a commonly used fish sign, which in its various forms may simply have meant "fish", or referred to stars or gods. In the uppermost, highest part of the Indus River basin there are relatively few genera and species: Diptychus, Ptychobarbus, Schizopyge, Schizopygopsis and Schizothorax snowtrout, Triplophysa loaches, and the catfish Glyptosternon reticulatum. Going downstream these are soon joined by the golden mahseer Tor putitora (alternatively T. macrolepis, although it often is regarded as a synonym of T. putitora) and Schistura loaches. Downriver from around Thakot, Tarbela, the Kabul–Indus river confluence, Attock Khurd and Peshawar the diversity rises strongly, including many cyprinids (Amblypharyngodon, Aspidoparia, Barilius, Chela, Cirrhinus, Crossocheilus, Cyprinion, Danio, Devario, Esomus, Garra, Labeo, Naziritor, Osteobrama, Pethia, Puntius, Rasbora, Salmophasia, Securicula and Systomus), true loaches (Botia and Lepidocephalus), stone loaches (Acanthocobitis and Nemacheilus), ailiid catfish (Clupisoma), bagridae catfish (Batasio, Mystus, Rita and Sperata), airsac catfish (Heteropneustes), schilbid catfish (Eutropiichthys), silurid catfish (Ompok and Wallago), sisorid catfish (Bagarius, Gagata, Glyptothorax and Sisor), gouramis (Trichogaster), nandid leaffish (Nandus), snakeheads (Channa), spiny eel (Macrognathus and Mastacembelus), knifefish (Notopterus), glassfish (Chanda and Parambassis), clupeids (Gudusia), needlefish (Xenentodon) and gobies (Glossogobius), as well as a few introduced species. As the altitude further declines the Indus basin becomes overall quite slow-flowing as it passes through the Punjab Plain. Major carp become common, and chameleonfish (Badis), mullet (Sicamugil) and swamp eel (Monopterus) appear. In some upland lakes and tributaries of the Punjab region snowtrout and mahseer are still common, but once the Indus basin reaches its lower plain the former group is entirely absent and the latter are rare. Many of the species of the middle sections of the Indus basin are also present in the lower. Notable examples of genera that are present in the lower plain but generally not elsewhere in the Indus River basin are the Aphanius pupfish, Aplocheilus killifish, palla fish (Tenualosa ilisha), catla (Labeo catla), rohu (Labeo rohita) and Cirrhinus mrigala. The last four are medium to large species that are important in fisheries and the last three have strongly declined. The lowermost part of the river and its delta are home to freshwater fish, but also a number of brackish and marine species. This includes including pomfret and prawns. The large delta has been recognized by conservationists as an important ecological region. Here, the river turns into many marshes, streams and creeks and meets the sea at shallow levels. Palla fish (Tenualosa ilisha) of the river is a delicacy for people living along the river. The population of fish in the river is moderately high, with Sukkur, Thatta, and Kotri being the major fishing centres – all in the lower Sindh course. As a result, damming and irrigation has made fish farming an important economic activity. The Indus is the most important supplier of water resources to the Punjab and Sindh plains – it forms the backbone of agriculture and food production in Pakistan. The river is especially critical since rainfall is meagre in the lower Indus valley. Irrigation canals were first built by the people of the Indus Valley Civilisation, and later by the engineers of the Kushan Empire and the Mughal Empire. Modern irrigation was introduced by the British East India Company in 1850 – the construction of modern canals accompanied with the restoration of old canals. The British supervised the construction of one of the most complex irrigation networks in the world. The Guddu Barrage is 1,350 m (4,430 ft) long – irrigating Sukkur, Jacobabad, Larkana and Kalat. The Sukkur Barrage serves over 20,000 km2 (7,700 sq mi). 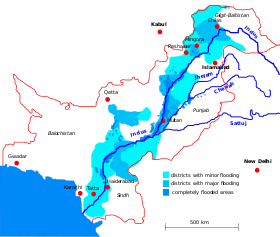 After Pakistan came into existence, a water control treaty signed between India and Pakistan in 1960 guaranteed that Pakistan would receive water from the Indus River and its two tributaries the Jhelum River & the Chenab River independently of upstream control by India. The Indus Basin Project consisted primarily of the construction of two main dams, the Mangla Dam built on the Jhelum River and the Tarbela Dam constructed on the Indus River, together with their subsidiary dams. The Pakistan Water and Power Development Authority undertook the construction of the Chashma-Jhelum link canal – linking the waters of the Indus and Jhelum rivers – extending water supplies to the regions of Bahawalpur and Multan. Pakistan constructed the Tarbela Dam near Rawalpindi – standing 2,743 metres (9,000 ft) long and 143 metres (470 ft) high, with an 80-kilometre (50 mi) long reservoir. It supports the Chashma Barrage near Dera Ismail Khan for irrigation use and flood control and the Taunsa Barrage near Dera Ghazi Khan which also produces 100,000 kilowatts of electricity. The Kotri Barrage near Hyderabad is 915 metres (3,000 ft) long and provides additional water supplies for Karachi. The extensive linking of tributaries with the Indus has helped spread water resources to the valley of Peshawar, in the Khyber Pakhtunkhwa. The extensive irrigation and dam projects provide the basis for Pakistan's large production of crops such as cotton, sugarcane and wheat. The dams also generate electricity for heavy industries and urban centers. The Indus River near Skardu, in Gilgit–Baltistan. The Dubair Khwarr, a tributary of the Indus, near Shaikhdara, in Khyber Pakhtunkhwa. The inhabitants of the regions are mainly Muslim as Pakistan is an Islamic country through which the Indus river passes and forms a major natural feature and resource are diverse in ethnicity, religion, national and linguistic backgrounds. On the northern course of the river in the state of Jammu and Kashmir in India, live the Buddhist people of Ladakh, of Tibetan stock, and the Dards of Indo-Aryan or Dardic stock and practising Islam. Then it descends into Baltistan, northern Pakistan passing the main Balti city of Skardu. A river from Dubair Bala also drains into it at Dubair Bazar. People living in this area are mainly Kohistani and speak the Kohistani language. Major areas through which the Indus river passes in Kohistan are Dasu, Pattan and Dubair. As it continues through Pakistan, the Indus river forms a distinctive boundary of ethnicity and cultures – upon the western banks the population is largely Pashtun, Baloch, and of other Iranian stock. The eastern banks are largely populated by people of Indo-Aryan stock, such as the Punjabis and the Sindhis. In northern Punjab and the Khyber Pakhtunkhwa, ethnic Pashtun tribes live alongside Dardic people in the hills (Khowar, Kalash, Shina, etc. ), Burushos (in Hunza), and Punjabi people. The people living along the Indus river speak Punjabi and Sindhi on the eastern side (in Punjab and Sindh provinces respectively), Pushto plus Balochi as well as Barohi (in Khyber Pakhtoonkha and Baluchistan provinces). In the province of Sindh, the upper third of the river is inhabited by people speaking Saraiki; which is a somewhat transitional dialect of the Punjabi and Sindhi languages. The Indus is a strategically vital resource for Pakistan's economy and society. After Pakistan and India declared Independence from the British Raj, the use of the waters of the Indus and its five eastern tributaries became a major dispute between India and Pakistan. The irrigation canals of the Sutlej valley and the Bari Doab were split – with the canals lying primarily in Pakistan and the headwork dams in India disrupting supply in some parts of Pakistan. The concern over India building large dams over various Punjab rivers that could undercut the supply flowing to Pakistan, as well as the possibility that India could divert rivers in the time of war, caused political consternation in Pakistan. Holding diplomatic talks brokered by the World Bank, India and Pakistan signed the Indus Waters Treaty in 1960. The treaty gave India control of the three easternmost rivers of the Punjab, the Sutlej, the Beas and the Ravi, while Pakistan gained control of the three western rivers, the Jhelum, the Chenab and the Indus. India retained the right to use of the western rivers for non-irrigation projects. Large-scale diversion of the river's water for irrigation has raised far-reaching issues. Sediment clogging from poor maintenance of canals has affected agricultural production and vegetation on numerous occasions. Irrigation itself is increasing soil salinization, reducing crop yields and in some cases rendering farmland useless for cultivation. And ecologically, the reduced flow of fresh water and silt into the Indus delta is threatening the area's mangrove forests. There are also concerns that the Indus River may be shifting its course westwards, although the progression spans centuries. Originally, the delta used to receive almost all of the water from the Indus river, which has an annual flow of approximately 180 billion cubic metres (240 billion cubic yards), and is accompanied by 400 million tonnes (390 million long tons) of silt. Since the 1940s, dams, barrages and irrigation works have been constructed on the river Indus. The Indus Basin Irrigation System is the "largest contiguous irrigation system developed over the past 140 years" anywhere in the world. This has reduced the flow of water and by 2018, the average annual flow of water below the Kotri barrage was 33 billion cubic metres (43 billion cubic yards), and annual amount of silt discharged was estimated at 100 million tonnes (98 million long tons). As a result, the 2010 Pakistan floods were considered "good news" for the ecosystem and population of the river delta as they brought much needed fresh water. Any further utilization of the river basin water is not economically feasible. Vegetation and wildlife of the Indus delta are threatened by the reduced inflow of fresh water, along with extensive deforestation, industrial pollution and global warming. Damming has also isolated the delta population of Indus River dolphins from those further upstream. "Temperatures are rising four times faster than elsewhere in China, and the Tibetan glaciers are retreating at a higher speed than in any other part of the world... In the short term, this will cause lakes to expand and bring floods and mudflows.. In the long run, the glaciers are vital lifelines of the Indus River. Once they vanish, water supplies in Pakistan will be in peril." "There is insufficient data to say what will happen to the Indus," says David Grey, the World Bank's senior water advisor in South Asia. 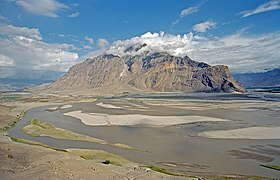 "But we all have very nasty fears that the flows of the Indus could be severely, severely affected by glacier melt as a consequence of climate change," and reduced by perhaps as much as 50 percent. "Now what does that mean to a population that lives in a desert [where], without the river, there would be no life? I don't know the answer to that question," he says. "But we need to be concerned about that. Deeply, deeply concerned." U.S. diplomat Richard Holbrooke said, shortly before his death in 2010, that he believed that falling water levels in the Indus River "could very well precipitate World War III." Over the years factories on the banks of the Indus River have increased levels of water pollution in the river and the atmosphere around it. High levels of pollutants in the river have led to the deaths of endangered Indus River Dolphin. The Sindh Environmental Protection Agency has ordered polluting factories around the river to shut down under the Pakistan Environmental Protection Act, 1997. Death of the Indus River Dolphin has also been attributed to fishermen using poison to kill fish and scooping them up. As a result, the government banned fishing from Guddu Barrage to Sukkur. Coming second after the Yangtze, and together with 9 other rivers, the Indus transports 90 % of all the plastic that reaches the oceans. Frequently, Indus river is prone to moderate to severe flooding. In July 2010, following abnormally heavy monsoon rains, the Indus River rose above its banks and started flooding. The rain continued for the next two months, devastating large areas of Pakistan. In Sindh, the Indus burst its banks near Sukkur on 8 August, submerging the village of Mor Khan Jatoi. In early August, the heaviest flooding moved southward along the Indus River from severely affected northern regions toward western Punjab, where at least 1,400,000 acres (570,000 ha) of cropland was destroyed, and the southern province of Sindh. As of September 2010[update], over two thousand people had died and over a million homes had been destroyed since the flooding began. The 2011 Sindh floods began during the Pakistani monsoon season in mid-August 2011, resulting from heavy monsoon rains in Sindh, eastern Balochistan, and southern Punjab. The floods caused considerable damage; an estimated 434 civilians were killed, with 5.3 million people and 1,524,773 homes affected. Sindh is a fertile region and often called the "breadbasket" of the country; the damage and toll of the floods on the local agrarian economy was said to be extensive. At least 1.7 million acres (690,000 ha; 2,700 sq mi) of arable land were inundated. The flooding followed the previous year's floods, which devastated a large part of the country. Unprecedented torrential monsoon rains caused severe flooding in 16 districts of Sindh. In Pakistan currently there are three barrages on the Indus: Guddu barrage, Sukkur Barrage, and Kotri barrage (also called Ghulam Muhammad barrage). There are some bridges on river Indus, such as, Dadu Moro Bridge, Larkana Khairpur Indus River Bridge, Thatta-Sujawal bridge, Jhirk-Mula Katiar bridge and recently planned Kandhkot-Ghotki bridge. Kala Bagh Barrage, Chasma Barrage, and Taunsa Barrage are also built in Punjab on the Indus. The entire left bank of Indus river in Sind province is protected from river flooding by constructing around 600 km long levees. The right bank side is also leveed from Guddu barrage to Lake Manchar. In response to the levees construction, the river has been aggrading rapidly over the last 20 years leading to breaches upstream of barrages and inundation of large areas. Tarbela Dam in Pakistan is constructed on the Indus River, while the controversial Kalabagh dam is also being constructed on Indus river. Video of River Indus at Kotri Barrage, Sindh, Pakistan. ^ The Indus Basin of Pakistan: The Impacts of Climate Risks on Water and Agriculture. World Bank publications. 2013-05-01. p. 59. ISBN 9780821398753. ^ "Geography: The rivers of Pakistan". Dawn. 26 September 2009. Retrieved 15 August 2017. ^ "Indus water flow data in to reservoirs of Pakistan". Retrieved 15 August 2017. ^ Thieme, P. (1970), "Sanskrit sindu-/Sindhu- and Old Iranian hindu-/Hindu-", in Mary Boyce; Ilya Gershevitch, W. B. Henning memorial volume, Lund Humphries, p. 450 : "As the great frontier river that represents the natural dividing line between India and Iran, the Indus could most easily and fittingly be called Sindhu- 'Frontier' by the Indians and Hindu- 'Frontier' by the Iranians." ^ Boyce, Mary (1989), A History of Zoroastrianism: The Early Period, BRILL, pp. 136–, ISBN 978-90-04-08847-4 : "The word hindu- (Skt. sindhu-), used thus to mean a river-frontier of the inhabited world, was also applied generally, it seems, to any big river which, like the Indus, formed a natural frontier between peoples or lands." ^ Bailey, H. W. (1975), "Indian Sindhu-, Iranian Hindu- (Notes and Communications)", Bulletin of the School of Oriental and African Studies, 38 (3): 610–611, doi:10.1017/S0041977X00048138, JSTOR 613711 : "The word sindhu- is used of a 'mass of water' (samudra-), not therefore primarily 'flowing' water. Hence the second derivation of 'enclosed banks' is clearly preferable." ^ Parpola 2015, Chapter 9. ^ "An A-Z of country name origins | OxfordWords blog". OxfordWords blog. 2016-05-17. Retrieved 2017-06-23. ^ Kuiper 2010, p. 86. ^ Holdich, Thomas Hungerford (1911). "Indus" . In Chisholm, Hugh. Encyclopædia Britannica. 14 (11th ed.). Cambridge University Press. pp. 507–508. ^ "564 Charul Bharwada & Vinay Mahajan, Lost and forgotten: grasslands and pastoralists of Gujarat". ^ a b "Indus re-enters India after two centuries, feeds Little Rann, Nal Sarovar". Retrieved 22 December 2017. ^ Albinia (2008), p. 307. ^ Williams, Brian (2016). Daily Life in the Indus Valley Civilization. Raintree. p. 6. ISBN 978-1406298574. ^ "Was the Ramayana actually set in and around today's Afghanistan?". ^ Clift, Peter D.; Blusztajn, Jerzy (15 December 2005). "Reorganization of the western Himalayan river system after five million years ago". Nature. 438 (7070): 1001–1003. doi:10.1038/nature04379. PMID 16355221. ^ Clift, Peter D.; Shimizu, N.; Layne, G.D.; Blusztajn, J.S. ; Gaedicke, C.; Schlüter, H.-U. ; Clark, M.K. ; Amjad, S. (August 2001). "Development of the Indus Fan and its significance for the erosional history of the Western Himalaya and Karakoram". GSA Bulletin. 113 (8): 1039–1051. doi:10.1130/0016-7606(2001)113<1039:DOTIFA>2.0.CO;2. ^ Zeitler, Peter K.; Koons, Peter O.; Bishop, Michael P.; Chamberlain, C. Page; Craw, David; Edwards, Michael A.; Hamidullah, Syed; Jam, Qasim M.; Kahn, M. Asif; Khattak, M. Umar Khan; Kidd, William S. F.; Mackie, Randall L.; Meltzer, Anne S.; Park, Stephen K.; Pecher, Arnaud; Poage, Michael A.; Sarker, Golam; Schneider, David A.; Seeber, Leonardo; Shroder, John F. (October 2001). "Crustal reworking at Nanga Parbat, Pakistan: Metamorphic consequences of thermal-mechanical coupling facilitated by erosion". Tectonics. 20 (5): 712–728. doi:10.1029/2000TC001243. ^ a b "Indus River" (PDF). World' top 10 rivers at risk. WWF. Archived from the original (PDF) on 25 May 2013. Retrieved 11 July 2012. ^ "WWF – Indus River Dolphin". Wwf.panda.org. Retrieved 2012-09-22. ^ Khan, W.A. ; Bhagat, H.B. (2010). "Otter Conservation in Pakistan". IUCN Otter Spec. Group Bull. 27 (2): 89–92. ^ a b c d e f g Mirza, M.R. ; Mirza, Z.S. (2014). "Longitudinal Zonation in the Fish Fauna of the Indus River in Pakistan". Biologia (Pakistan). 60 (1): 149–152. ^ a b c Sheikh, M.; Laghari, M.Y. ; Lashari, P.K. ; Khooharo, A.R. ; Narejo, N.T. (2017). "Current Status of Three Major Carps (Labeo rohita, Cirrhinus mrigala and Catla catla) In the Downstream Indus River, Sindh". Fisheries and Aquaculture Journal. 8 (3). doi:10.4172/2150-3508.1000222. ^ "Tarabela Dam". www.structurae.the cat in the hat. Retrieved 2007-07-09. ^ "Technology Breakthroughs for Global Water Security: A Deep Dive into South Asia". Retrieved 24 December 2018. ^ a b Amjad, A. Shah; Kasawani, I.; Kamaruzaman, J. (2007). "Degradation of Indus Delta Mangroves in Pakistan" (PDF). International Journal of Geology. 1 (3): 29. Retrieved 24 December 2018. ^ "Indus Delta, Pakistan: economic costs of reduction in freshwater flow" (PDF). International Union for Conservation of Nature. May 2003. ^ Sarfraz Khan Quresh (March 2005). "Water, Growth and Poverty in Pakistan" (PDF). World Bank. ^ "Pakistan's water economy: getting the balance right". July 2018. ^ Walsh, Declan (2010-10-21). 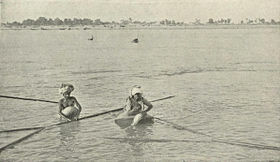 "Pakistan floods: The Indus delta". The Guardian. ^ Walsh, Declan (2010-10-05). "Pakistan's floodwaters welcomed along Indus delta". The Guardian. ^ "River basin development phases and implications of closure". CiteSeerX 10.1.1.485.4832. ^ "Integrated Water Resource Systems: Theory and Policy Implications" (PDF). Retrieved 22 June 2018. ^ "Indus River Delta". World Wildlife Fund. Archived from the original on 2012-01-23. ^ "Global warming benefits to Tibet: Chinese official. Reported 18 August 2009". 17 August 2009. Archived from the original on 23 January 2010. Retrieved 4 December 2012. ^ Farrow, Ronan (2018). War on Peace: The End of Diplomacy and the Decline of American Influence. W. W. Norton. ISBN 978-0393652109. ^ "SEPA orders polluting factory to stop production". Dawn. 3 Dec 2008. Retrieved 28 June 2012. ^ "Fishing poison killing Indus dolphins, PA told". Dawn. 8 Mar 2012. Retrieved 27 April 2016. ^ "'18 dolphins died from poisoning in Jan'". Dawn. 1 May 2012. Retrieved 28 June 2012. ^ "Threat to dolphin: Govt bans fishing between Guddu and Sukkur". The Express Tribune. 9 Mar 2012. Retrieved 28 June 2012. ^ "Almost all plastic in the ocean comes from just 10 rivers - 30.11.2017". DW.COM. Retrieved 2018-08-22. about 90 percent of all the plastic that reaches the world's oceans gets flushed through just 10 rivers: The Yangtze, the Indus, Yellow River, Hai River, the Nile, the Ganges, Pearl River, Amur River, the Niger, and the Mekong (in that order). ^ Schmidt, Christian; Krauth, Tobias; Wagner, Stephan (2017-10-11). "Export of Plastic Debris by Rivers into the Sea". Environmental Science & Technology. American Chemical Society (ACS). 51 (21): 12246–12253. doi:10.1021/acs.est.7b02368. ISSN 0013-936X. PMID 29019247. ^ "Indus Basin Floods" (PDF). Asian Development Bank. 2013. Retrieved 20 November 2018. ^ Bodeen, Christopher (8 August 2010). "Asia flooding plunges millions into misery". Associated Press. Retrieved 8 August 2010. ^ Guerin, Orla (7 August 2010). "Pakistan issues flooding 'red alert' for Sindh province". British Broadcasting Corporation. Retrieved 7 August 2010. ^ "BBC News – Pakistan floods: World Bank to lend $900m for recovery". bbc.co.uk. 17 August 2010. Retrieved 2010-08-24. ^ "BBC News – Millions of Pakistan children at risk of flood diseases". bbc.co.uk. 16 August 2010. Retrieved 2010-08-24. ^ "Pakistan floods: Oxfam launches emergency aid response". BBC World News South Asia. 14 September 2011. Retrieved 15 September 2011. ^ a b "Floods worsen, 270 killed: officials". The Express Tribune. 13 September 2011. Retrieved 13 September 2011. ^ "Government to launch Kandhkot-Ghotki bridge over River Indus next month: Sindh CM". The Express Tribune. Retrieved 1 August 2016. ^ "Pakistan: Getting More from Water (see Page 50)" (PDF). World Bank. Retrieved 29 March 2019. World Atlas, Millennium Edition, p. 265. Jean Fairley, "The Lion River", Karachi, 1978. This page was last edited on 20 April 2019, at 01:45 (UTC).